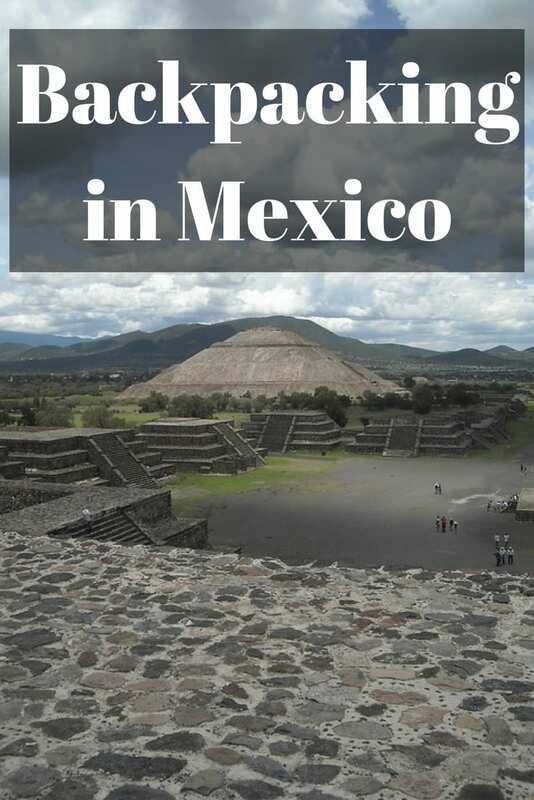 My experiences backpacking Mexico, which covered most of the main archaeological sites. 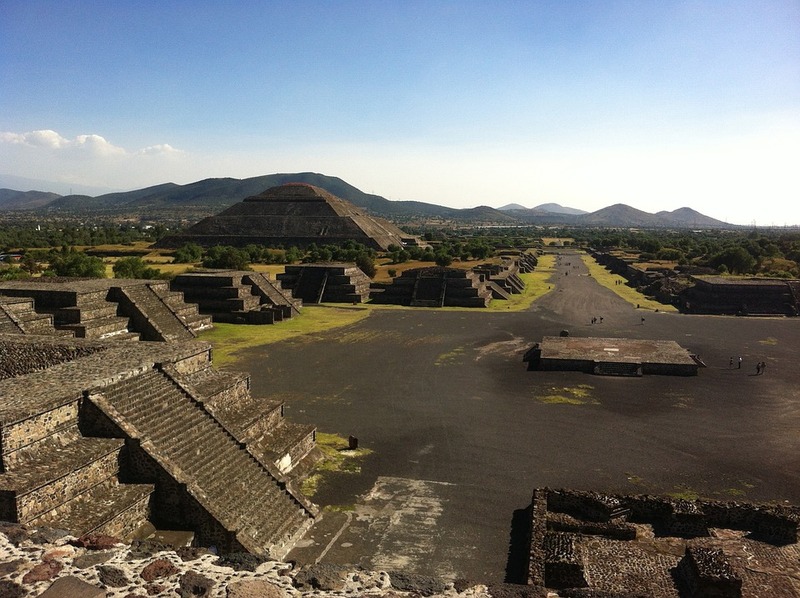 Along the way, I visited Teotihuacan, Palenque, Monte Alban and more! I took a look at this travel blog post about backpacking Mexico again in 2018. The first thing that I realised, is that this must have been the very first travel blog post I ever wrote! The second thing, is I realised my writing style has changed over time. I was left with a choice. I could completely rewrite this post about backpacking in Mexico, or perhaps just tidy it up a little. I've decided to take the latter approach, as I actually found it interesting reading back on my backpacking Mexico experiences. For example, I had completely forgotten that my backpack didn't turn up on the flight! Here then, are my mainly unedited experiences backpacking Mexico in 2005. Buenos tardes!! My trip started at Great Doddington Working Mens Club, where I had to enjoy/endure a Bush Pigs gig whilst waiting for a lift to the airport. After they had finished playing to an incredible cross section of the gene puddle, I helped my brother pack up, and at 01.00 am we were on our way to the airport. I managed to grab a couple of hours sleep in the waiting hall, and then booked in for 05.15. Caught the plane to Madrid and then the connecting one to Mexico City with no major hassles. The 13 hour flight was a bit boring, with far too few food breaks for my liking, but you can't have it all!! Breezed through customs, and then waited for my luggage. You know how every time you wait for your luggage, you have this nagging suspicion it is never going to come, followed by the joy of seeing it trundle along? Well, I just didn't get to feel the joy this time! Seems that some bright spark had decided to send it on to Barcelona for me. There wasn't much that anyone could do about it, so I filled in the forms, and headed into the main airport arrivals section with the promise that my backpack would be delivered to the hotel the next day. In Mexico city airport, there are two stands from which to book a taxi :- pro taxis and one marked authorisad taxi, so I went with that one, and it cost 125 pesos to the hotel. Hotel Isabel is a very big old place, with tall ceilings and large, spacious rooms. I'd prebooked a single room with bathroom for five nights at 200 pesos which is pretty good value for a capital city. Ok, there are cheaper places, but sometimes its a false economy to book somewhere dirt cheap for the first few days. It's much better for me to get over jet lag and into the swing of things in my own space and at my own time. So, quick list of the stuff I had with me. Toothbrush and toothpaste, laptop, and camera. Bugger. Luckily, the room had towels and soap, so that solved my immediate problems, but I had no fresh clothes, and I'd already been in mine for over 36 hours. Hold on, what's that at the bottom of my hand luggage… Lynx deodorant!! You beauty!! With the power of lynx, I'd be able to keep the same clothes on for days!! !..and then I fell asleep. Day 2. Nice breakfast at the hotel, and wandered into the zocola (the main square in Mexican cities). Made a telephone call to check on my backpack, and they said it might be with me the following day. Oh well. At the Zocola, I bought a two day pass for the tourist bus, which does a route of all the major sites. A word of warning. If your backpack containing your sunblock and aftersun is lost, and you have no hair, don´t ride on an open top bus for three hours, else you might go a touch red!! Had lunch, bought a razor blade, decided to veg. Did a lot of thinking about what to do if the rucksack was permanently lost, and was saved the worse case scenario when it arrived later in the evening. Oh, after-sun and clean pants!!! Day3 First stop was the Templo Mayor, practically the only Aztec ruin left within Mexico city itself. I won´t say that it was the most outstanding site that I've ever visited, but it was interesting all the same. The museum showed just how completely the conquistadors levelled the Aztec empire. Back onto the tourist bus, and I saw a demonstration being carried out by a thousand men in their swimming trunks. Not quite sure what that one was all about, and quite frankly I was a bit worried to ask! Got dropped off at the Museo Nacional de Antroplogia, and spent a fair few hours wandering around it. Its an amazing museum, which focuses on the major meso-american civilisation and cultures. A must see, and I recommend hiring the electronic guide to get a bit more out of it. At the height of its power and influence, Teotihuacan must have been the most imposing city in the Americas, with a population suggested to be anywhere between 80,000 and 200,000 people. 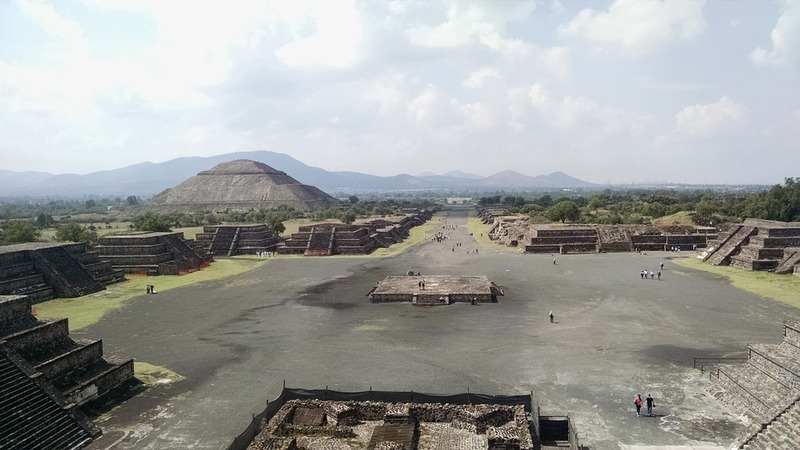 It is doubtful whether those people would have lived in the religious area which we now know as Teotihuacan, but they would certainly have lived in the surrounding countryside and paid tribute to the centre. Building started in the area as early as 600BC, and the pyramids which are now the sites dominating feature were likely to have been completed by 200AD. 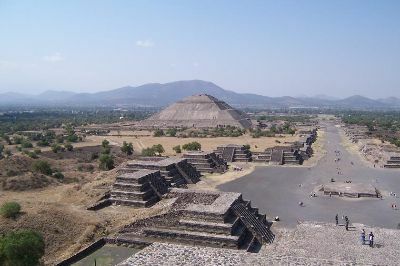 The Teotihuacan civilisation's influence can be seen in other sites , who would have been trading partners, located in what are now modern Mexico, Guatemala and Honduras. As with all great civilisations though, decline was inevitable. 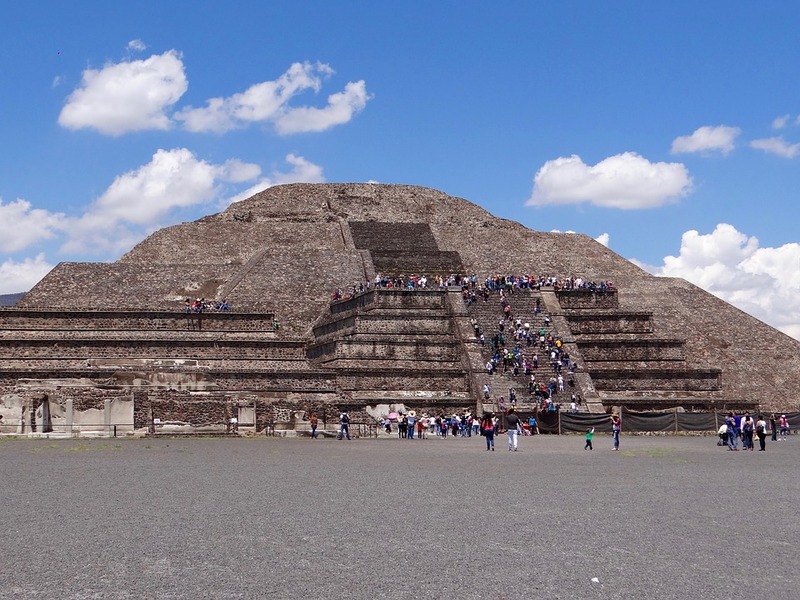 Whether through over farming, climatic change, social upheaval, war or all those things, by the time of the Aztecs Teotihuacan was a ruin full of mystery. To them, it represented a holy place from a long forgotten era, shrouded in myth, and it was they who gave it the name Teotihuacan, or ‘The Place Where Men Became Gods’. Although the Temple of the Sun is the largest and most eye catching structure on the site, I believe the Temple of the Moon to be the most important one. The 2 km long ‘Street of the Dead’ heads directly to the Temple of the Moon and not the Temple of the Sun, and Moon ceremonies were in all probability held more often than Sun ceremonies. There was very little shade at Teotihuacan, but it was good to rest in what there was, and think that 2000 years ago some ancient builder took time out here too. I wonder if he knew what he was building, and that it would last for so long? After a while, it was time to move on and return to the hotel, although its splendour would always stay with me. The next day, it was time to continue the backpacking Mexico experience, and catch a bus to Oaxaca (pronounced oWhacka). Sweet, no worries. On arrival in the city, I jumped into a cab and went to Hostal Don Mario. It was a bit of a shambles, but the people there were friendly enough. 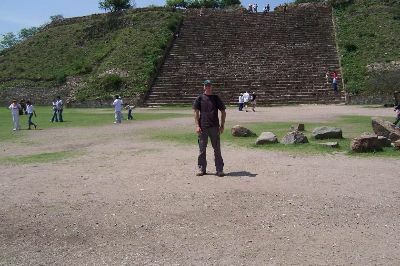 I took a tour to Monte Alban, as I wanted to see if having a guide would be any better than just reading about a site and then ‘doing it’ myself, and as I thought he was pretty good, it was money well spent. This site is set on a flattened out hill top, with impressive views over the valley below. Whoever created the site must have commanded a huge workforce to build the place, which involved levelling the ground and raising the buildings without the aid of the wheel or beasts of burden. Again to keep the city supplied must have involved a lot of work, as with no naturally occurring sources of water, it would have been carried up and stored in vast urns during the dry season. Unlike Teotihuacan, with whom the city had trading links, there were no colossal pyramids, but rather smaller (still pretty big though!!) temples. 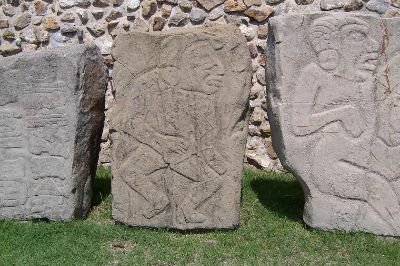 One of the most interesting parts of the site, was the area in which stone tablets called ‘the dancers’ were found, depicting ‘Olmec’ characters in various poses. The Olmecs have distinctively African features, and mystery surrounds their origins as does the meaning of the stone tablets. To some, they are a medical textbook, showing birthing positions and deformities. To others, they are sacrificial victims, prisoners, or dancers. I go with the medical textbook theory. So was Monte Alban a city? It was certainly the religious and academic centre for the surrounding region, but I don’t think that it could be thought of as a city in itself. Whilst the site is large, it seems more likely that only priests and the rulers would have actually lived there, although the population from the valleys below would then have climbed up to worship on special occasions. Got an overnight bus to San Christobel de la Casas, and managed to get some sleep, unlike one poor guy looked like he'd been tied to the bumper and dragged behind us for the twelve hour journey! Booked into a hotel opposite the bus station which had some parrots which kept wolf whistling. After a night in town, I then moved on to Palenque. Arrived in Palenque town safe and sound, and decided to ignore the guide books, and find the cheapest place humanly possible just for the hell of it. And the winner is… 60 pesos a night.. about three quid. Bargain! At that price, there's nothing to complain about really, but lets just say that it wouldn't be to everybody's taste!! 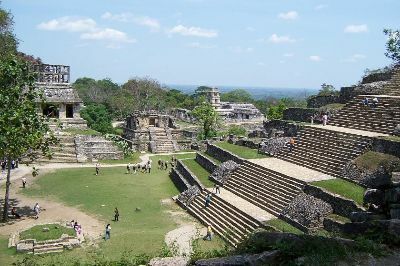 I reached this site on a tour which left from the town of Palenque and included the ancient site of Yaxchilan. It takes about three hours to get there by road, and as its one of the less visited sites, it has none of that ‘conveyor belt’ feeling as you are walking around. The main difference between this site and the others that I have visited so far, is that this place actually looks like a town centre as opposed to a religious centre, but what it is most famous for, are the outstanding murals. To get to Yaxchilan, was another hour by road, and then a really nice fifty minutes by river boat. Again, I could see this site as a town rather than a religious centre. It had a plaza, a ball court, and several sweat lodges. (Why on earth they wanted sweat lodges when the humidity is so high is beyond me!). Built as it is,I had my reservations about this site, because it is such a major tourist hotspot, but it was nice to be proven wrong, and I would strongly recommend a visit. The buildings are impressive, and there didn’t seem too many people there (maybe the time of year). Doing it without a tour was definitely better, as it gave me lots more time to wander around at my own pace, and to be able to sit chilling out at the top of temples… Oh no, hippy alert!! Again, you can tell this site developed from a town into something much more, rather than at Teotihuacan, which was firstly a religious centre. with the wealth of the river, one can see how this town developed over the ages, and became a controlling power within the area. I had my reservations about this site, because it is such a major tourist hotspot, but it was nice to be proven wrong, and I would strongly recommend a visit. The buildings of Palenque in Mexico are impressive, and there didn’t seem too many people there (maybe the time of year). Doing it without a tour was definitely better, as it gave me lots more time to wander around at my own pace, and to be able to sit chilling out at the top of temples… Oh no, hippy alert!! Again, you can tell this site developed from a town into something much more, rather than at Teotihuacan, which was firstly a religious centre. The bus journey to Villahermosa went without a hitch, and they were showing King Arthur on the video screen in English with Spanish subtitles which was convenient for me but not for the forty other Spanish speaking Mexicans! 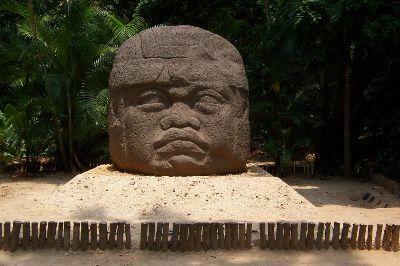 The reason for going to Villahermosa was solely to visit La Parque Venta, which is now the home of the famous Olmec Heads. Carved out of basalt rock over two thousand years ago, they are puzzling because the figures appear to have African features. Since I can remember I’ve always been into books about unexplained mysteries, and these figures were something I’ve always wanted to see in real life. That’s another line to put a tick next to on my list of ‘Things I really want to do and see'! The day after, it was onto Campeche. It was one hell of a long bus ride, during which I got to see King Arthur again (! ), and a film called Raising Helen which seemed quite good, but kept going quiet during the important bits. Arrived at Campeche at four, and took a taxi to the Zocola, where I booked into a hostal for two nights. It was Sunday, and the Zocola had been cordoned off so that the women of the town could set their table and chairs up and play bingo. Wasn’t too sure about the band playing in the bandstand though. The next day, I was due to go on a tour of Edzna, but had a slight case of the runs so didn’t think it wise. I travelled through India and Asia without having any sort of stomach upset, but this was pretty bad. Three days later, I was down from seventeen violent dispatches a day to just the four… The relief was incredible! Uneventful bus journey to Merida, where I ate cakes and Immodium, and the film was some obscure Portuguese one with Spanish subtitles which my tiny brain found to be wholly confusing. On arrival, wandered over the road and booked into the shabbiest looking hotel for four nights for the sheer hell of it. The woman was a bit surprised that I wanted to rent it for the whole night and not just by the hour, but we managed to come to an agreement in the end. I’ve seen ALL sorts of bizarre goings on there, I can tell you!! Much better than TV. Next day, I bought a bus ticket for the Ruta Puuc, which is a bus which visit’s a handful of minor sites. Who knows, you might be out here one day, so here’s where it goes.. It was worth it, but quite tiring (not too much running to the toilet though!! ), and if I could have spent another hour at Uxmal it would have been perfect. Yesterday, (19.05.05) I took a trip to Chichen Itza, which is about 2 hours journey from Merida. This is the main Mayan site of the Yukatan peninsular, with a spectacular pyramid and the biggest ball court of the ancient American world. Despite the fact the place was infested with tourists, crawling over everything and swarming from place to place (and hey, I was one of them!! ), it was really interesting. I climbed up the inside of the pyramid, to an altar where there is a reclining Chac Mool (God of rain or water allegedly) and a jaguar throne. In the Mayan world, Chac is usually shown as just a face, goggle eyed and with a trunk, whereas the Zapotecs and Aztecs show him as a more human figure, reclining and holding a bowl on his stomach. This is one of the things which makes the site archaeologically important, because it displays such a mix of cultures, although the current theory is that it has always been Mayan, but influenced through trading partners. I’ve got a slightly different theory , which is that the goggle eyed trunk nosed Chac was a God worshipped in times of peace and plenty, whereas the reclining Chac-Mool was worshipped during drought years, and the plate on his stomach was used to offer sacrifices to the Gods to bring rain. As none of us were alive then, we’ll never know really!! I got to Tulum without any problems, and booked into a hotel near the bus station for a couple of nights. Tulum is divided into two parts, the town, which basically stretches out along the main road, and the beach resorts. Tulum ruins are down by the beach, and although everybody and the guide books says that it is only 2km from the village, they are definitely lying, as it’s a good 45 minute walk there and another 45 back. The ruins themselves are interesting as it is practically the only Mayan trading port, and takes the form of a semi-fortress, with three walls and the sea its fourth. As a spectacle it was a little disappointing as there were no temples or monuments to speak of, but at least the exercise did me good!! A good couple of restaurants in the town as well, which was a bonus. The next day I caught the local bus to the town of Coba. The village itself wasn’t much to write home about (but I am though! !… strange!! ), and the only purpose for its existence is the ruins close by. Once in the grounds of the site, I hired a mountain bike, and cycled from place to place, which was a wise move as some of the buildings were some distance apart. The most impressive was the ’Big Pyramid’, which is apparently the tallest in the Yucatan. It was a good climb up and not for the faint hearted or those suffering from vertigo!! The views from the top were incredible, and you could see jungle for miles all around. As a priest or King, you would certainly have felt powerful from up there…. Or maybe they just went there to get out from the crowds!!! After finishing cycling around the site, which bought back fond memories of my cycle trip around New Zealand, I walked back up to the village and had a meal. I would have had a couple of hours to wait for the bus, and a couple of Italian ladies were in the same boat, so we decided to club together and get a taxi back instead. Bought a bus ticket for Chetomal. Chetomal is the border town with Belize. My hotel was expensive, but the room was one of the nicest I’d stayed in for a while. Border towns are funny places, and this was no exception. People from both sides of the border crossing over to buy certain goods cheaper, and smuggle stuff through, and shifty money changers wearing lots of gold. I didn’t really have much to do for the day, as I crossed on the next. Crossing over borders by land is always an experience. You’re never quite sure of the routine, or what will happen. There was a bit of a wait for the bus to fill up before it left, but at about 2 pounds for the 100 mile trip, I wasn’t complaining. Once the bus had filled up with people carrying their bargains for resale back in Belize (sweets, toilet roll and cuddly toys), we were on our way. There was only one other Westerner type on the bus. I say type, because I couldn’t work out if he was American, Mexican or European and he was just acting very strangely. He sat at the back of the bus for the start of the journey, and then as we approached the border he came and sat next to me. We had to get off the bus first at the Mexican side, and I sailed through with no problems, whilst this guy had to fill out some form or another. Back on the bus, they drove us to the Belize side, where we go off once more. This time, the guy kept hanging around at the back of the bus so that he was the last one off. I and everybody else breezed through customs with only the briefest formalities and got back on the bus again, but this guy was nowhere to be seen. The bus driver went to look for him, but seems he was detained because five minutes later we left without him. And that end the backpacking in Mexico blog post. The travel adventure through central and south America continued on to Belize! For a more updated version of things to see when backpacking Mexico, check this blog post out – what to see when visiting Mexico.